Every week, the crew of the U.S.S. Sally Ride goes on a journey through the cosmos, to seek out new life and new civilizations, and boldly go where no one has gone before. Shield of Tomorrow is a new actual play show from Geek and Sundry, the creators of the long running and popular Dungeons and Dragons series Critical Role. Like Critical Role, Shield of Tomorrow is a weekly web series that gathers a group of top-notch roleplayers to entertain you while playing a tabletop game. But Shield of Tomorrow takes place in the Star Trek Universe, and uses Mophidius’ new Star Trek Adventures system to play. On top of how cool that all sounds, Star Trek Online is happy to announce that we’re teaming up with the crew of the Sally Ride, and you can win sweet STO prizes just by tuning in. They’ll be giving out prizes like Temporal Special Agent Starter Pack every other week, starting with their brand new episode tonight, July 26th. You can tune in on their Twitch Channel, or on their streaming service, Alpha, at 9:30 PDT. The show is the brain child of Eric C. Campbell, who is their host and gamemaster, and also a giant STO fan, and he was kind enough to sit down with us to talk about the show. Our Lead Ship Designer, Thomas Marrone, enjoyed the show so much he made a mission patch, based off actual NASA patches! 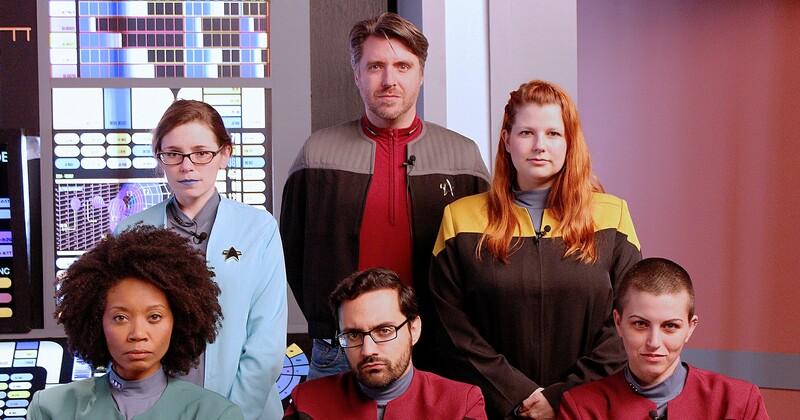 I’m Eric Campbell, Director of Development at Geek & Sundry and host of Shield of Tomorrow, our new livestreamed Star Trek roleplaying game show. What was your first introduction to Star Trek? My grandfather brought home a box of junk he got a garage sale. I still remember him casually handing me a VHS tape and saying, “Got this… for you.” I was nine years old and I didn’t know that my grandfather had just handed me a spaceship that was going to take me on the adventure of my life. I doubt he realized that little moment -- of passing that VHS tape into my hand -- was going to be a defining moment in my life and one of the fondest memories I would have of him. What do you think has made Star Trek have such a lasting impression? Oh man! I’m not sure what I could add to this that hasn’t already been said by profound minds! I can only speak of my own personal experience in this case, or I risk repeating what others have said more eloquently. Star Trek normalized diversity for me. It untethered me from the confines of the modern age and made the Universe my playground. It also showed me that science and exploration can be just as thrilling and incredible as any large-scale battle scene or sword fight. Lastly, it brought home to me that relationships with those around us can be our greatest strength. How does that relate to Shield of Tomorrow, and the kind of stories you’re going to be telling? The title, Shield of Tomorrow, was chosen after I asked myself the very basic question of what the story of this crew might be. It’s a game, but it’s also a story with social commentary, just like the entire Star Trek franchise. The Dominion War is on the horizon, but the crew joined Starfleet to be explorers and scientists. Their main motivation is to preserve what Starfleet was always meant to be: an institution of exploration and diplomacy. Alarmists attitudes will mount, Changeling paranoia will grow, high ranking officers will recommend more Warships to be built. These issues have clear parallels in our modern-day world. These will be stories about a crew who must relentlessly strive to keep our curiosity alive, to keep our minds open, to keep compassion and science at the helm as they journey into the unknown. 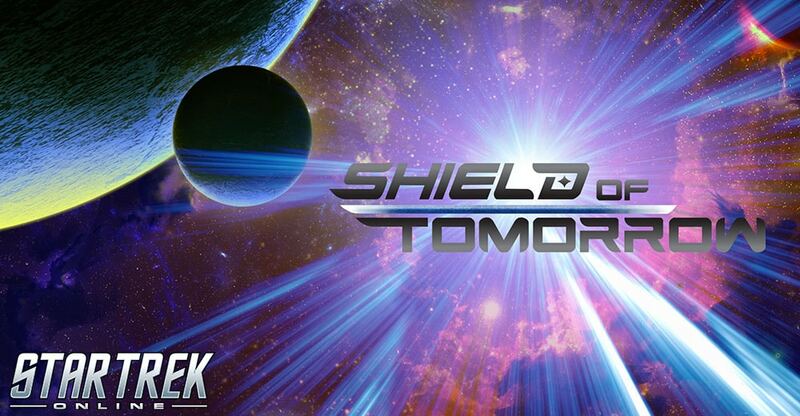 What can we expect each week on Shield of Tomorrow? Great question! The wonderful thing about running a live RPG like this is that no matter how many years you run games, there’s not a lot you can predict when it comes to players and how the story unfolds. But one thing I feel confident in, is that you can expect to see a bunch of fellow Star Trek lovers indulging themselves buy playing in the sandbox Gene built for us all. We may not be a Star Trek show, but as a show about Star Trek, I think my fellow Trekkies will get a kick out of it. Tell us a little bit about the cast and the characters they’ll be playing. Hector Nevarro is our Captain, Rafael Martinez, a human who is idolizes a legendary figure in Starfleet and is now realizing the pressures that come with his very first Command. Sam De Leve plays Commander Junil Rue, his First Officer/Tactical Officer. Rue is a Joined Trill, but this is the first host the Symbiont has ever had. Rue also works with a disability, a side effect of removing Borg nanites which permanently damaged their body during the Battle of Wolf 359, where they served. Lt. Cmdr Throlo Sh’Shirros is our Andorian Chief Medical Officer played by Amy Dallen. Amy might be the biggest Trekkie I’ve ever met, which is saying a lot, considering Hector is in the group. Then we have Aliza Pearl, our Vulcan Science Officer. Aliza is part of an Improvisational Star Trek show going on three years now here in LA, called The Improvised Generation, which is a non-scripted stage performance of the USS McGinley and her crew. Last but not least is Bonnie Gordon of the Library Bards music group, who plays Ensign Lark Sage, a young Bajoran raised on Earth by her adopted family. Ensign Sage is our helmswoman and Operations officer for the ship. The Engineer is a grumpy Tellarite on the verge of retirement, named Zhiv, played by myself. How does the Star Trek Roleplaying system compare to other systems you’ve played? It took some getting used to! Rolling 1’s is good, rolling 20’s is bad. That’s a concept that’s borderline blasphemy for most gamers! But the system is quite elegant. I have heard some describe it as crunchy, meaning heavy on rules, but I think it’s simple. It just takes a bit of practice. The part I love the most though, is that the group operates as a team using the Momentum counters. One of the choices we made when we started putting the game together was to leave room for us to figure out the system as we play live, thus allowing the audience to learn as they watch. This is really in keeping with what I wanted from the show to begin with. I am against the idea of Shield of Tomorrow becoming more than an RPG show. It’s first and foremost, a collaborative story telling experience meant to not only share Star Trek, but the joy of role playing with friends. How long have you been playing Star Trek Online? I’ve been playing since the beta! I was there when then Borg invaded Earth Space dock and experienced the full madness that followed! I’ve been a lifetime subscriber for a few years now! What about Star Trek Online appeals to you as a Star Trek fan? For me, it’s been the community. Customization is something that Cryptic has developed a great reputation for and the evolution of the game has really opened up opportunities for you to customize not only how you look, but the overall course you take in leveling your character. The role-playing communities in STO have all been very kind as well. In fact, I have a few friends who are now IRL friends that I met in my early years on STO! Most of us have never seen each other face-to-face, but keep up with each other on Facebook and what not. What’s your favorite content in the game? Anything that has anything to do with the KDF. All my most powerful characters are Federation or Romulan, but my favorite will always be the Klingons. That is my sweeping answer to this question. I’ve loved every piece of content that has come out, that adds more to the KDF side! QAPLA’! Loves KDF, eh? Now there’s something a certain community manager can respect. Shield of Tomorrow airs every Wednesday at 9:30 PM PDT on Geek and Sundry’s Twitch Channel and on Alpha.